Why Are We selling Natalie Decker Short? After a great run in Daytona Natalie Decker is being pushed by almost every media outlet as the next Danica Patrick? Why are we selling her short? The similarities are obvious, both are good looking women, both are marketing powerhouses and both drive race cars. Why is Decker the next Patrick? Why not the next Janet Guthrie? The next Shawna Robinson? The next Jimmie Johnson? Jeff Gordon? Or better yet, Natalie Decker. Having been in this sport longer than Decker has been on the planet I am considered a knuckle dragging Neanderthal by most and an old geezer by the rest but ladies in motorsports, I’m all in. Thank you for following your dreams! Thank you for loving the sport! So as a knuckle dragger I’m a little uncomfortable with one driver telling another they love them but don’t be fooled, these ladies like their male counterparts take on a different persona when the helmet goes on. As a journalist I’ve had the great opportunity to interview, Patrick, Robinson and Decker, all can hit the charm button whenever they want. (Guthrie is still on my list) I’ve also seen the competitor in all and trust me the drive to succeed is as great as any man on the planet. In 2000 we were doing TV for the Outdoor Channel and had just done a sit down interview with Shawna Robinson. Honey let me tell you she even had the camera men salivating. She left us to go qualify and we caught back up with her as she was getting out of the car after a less than stellar performance. Camera rolling I had my usual post qualifying question and I got “That’s a stupid **&% question where do you come up with *&&$%%( like that.” She stormed off. Guys meet Shawna Robinson the competitor; thank goodness we were taping and not live. Needless to say it still sticks with me 18 years later; the desire in Robinson was incredible it has served her well in racing and in life. The same can be said for Patrick, her temper has been well documented and you can’t be as successful as she is without being a pretty smart cookie. So why not compare Decker to these ladies? Because I think she can be better than all of the above, if…..
As a spotter and car owner in the ARCA Series I’ve had a chance to watch Decker perform from short track to superspeedway. Is she the best race car driver I’ve ever seen? Nope. Is she a rookie with a lot of talent? Yep. So what’s it going to take? First she’ll be pushed by some to move up quickly and take opportunities that aren’t in her best interest. Fortunately she drives for Venturini Motorsports. Big Bill (Venturini) has sent more big time drivers to NASCAR over the last 20 years than any other development team in the sport. He’s been there done that many times over. There will be many outside voices giving Decker advice, shut them out. Most just want to try and exploit her to make money, tell them no. The old fat guy will lead you in the right direction. Most importantly Decker needs to spend the next year or two becoming a better race car driver and learning the skills needed to be successful as a driver/personality in big time auto racing. A pole and a top 5 at Daytona is a good start, tracks like Berlin, Toledo, Charlotte, Kentucky, grinding out the full ARCA season will make her a driver that can compete at the next level. My view from the roof, she is not scared. 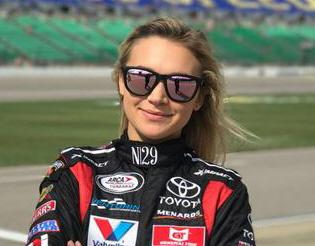 If Decker continues to put all the pieces of the puzzle together she will not be remembered as the next Guthrie, Robinson or Patrick but as Natalie Decker Driver.